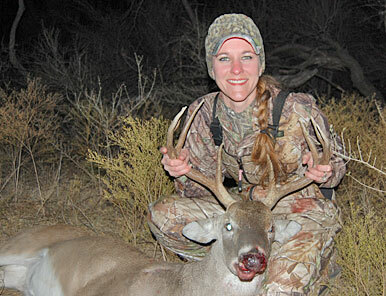 Krystal Russell was hunting with her husband on a new lease during her state's rifle season. The couple had seen all manner of deer on their trail cameras throughout the summer and the young hunter was hoping that a shooter would step out near her stand. After an afternoon of seeing all kinds of activity, this mature eight-point buck strolled through and Krystal got to work with her rifle, dropping the buck where he stood. "This is what dreams are made of. I can't believe how amazing it is to be out in the outdoors and see beautiful creatures such as this deer," shared Krystal. We couldn't agree more Krystal. Congrats on a nice buck!